In the first half of the twentieth century, it was railroads -- using geared steam locomotives -- that facilitated logging California's enormous stands of virgin timber. They conquered the rugged terrain with steep grades, switchbacks and inclines, and proved to be a practical means of transporting logs to the mills. 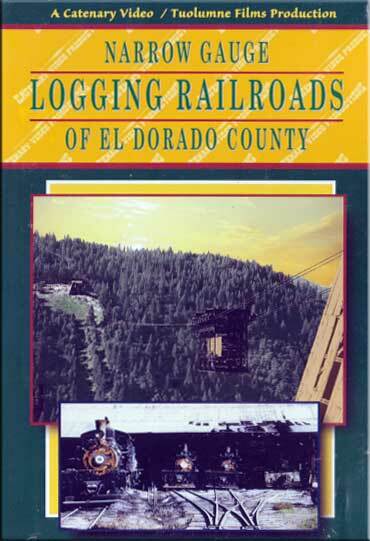 Many of these diminutive carriers were narrow gauge, and two of the most fabled, but least documented, were the Diamond & Caldor and Michigan-California, with its sensational 1200 foot high, 1/2 mile cableway spanning the American River gorge in remote El Dorado County. Catenary Video's continuing coverage of steam era logging offers rare 1935-1950 historical footage of these slim gauge operations - from the woods to the mills. Also shown is the standard gauge, eight mile Camino, Placerville and Lake Tahoe Ry. It's all captured in digitally transferred, mostly color footage, with authentic sound effects. Also shown is the work going on today to restore to operating condition the #4 Shay of the Diamond and Caldor. Digitally enhanced sound and images; mostly in color with narration and sound effects. Mostly Color with narration and sound effects. Jeff (France) on 2013-07-23 09:58:07. You can see in colors the last geareds locomotives in the west ! Lee R. (From El Dorado County, Camino) on 2011-09-15 05:22:59. Great Video History...I got one of the last VHS Tapes, glad they came out with it on DVD...The Production Co. seems to have gone by the wayside..A Great Era for Camino, Placerville, Diamond Springs, For anyone who grew up in El Dorado County.